The elastic behavior of nucleicacids (NAs) has been under investigation for decades and is a critical determinant in biological processes such as genome compaction and gene expression. Early work characterizing the elasticity of long NAs (>>1 kb) led to the development of the worm-like chain (WLC) model. There has since been interest in—and much debate on—the behavior of short NAs (<150 bp), in particular its potential deviation from the canonical WLC model. The Chemla group recently developed a highly sensitive approach to measure elastic behavior at “ultrashort” length scales (<15 bp), which has remained poorly characterized yet is relevant to many nucleic-acid processing enzymes. 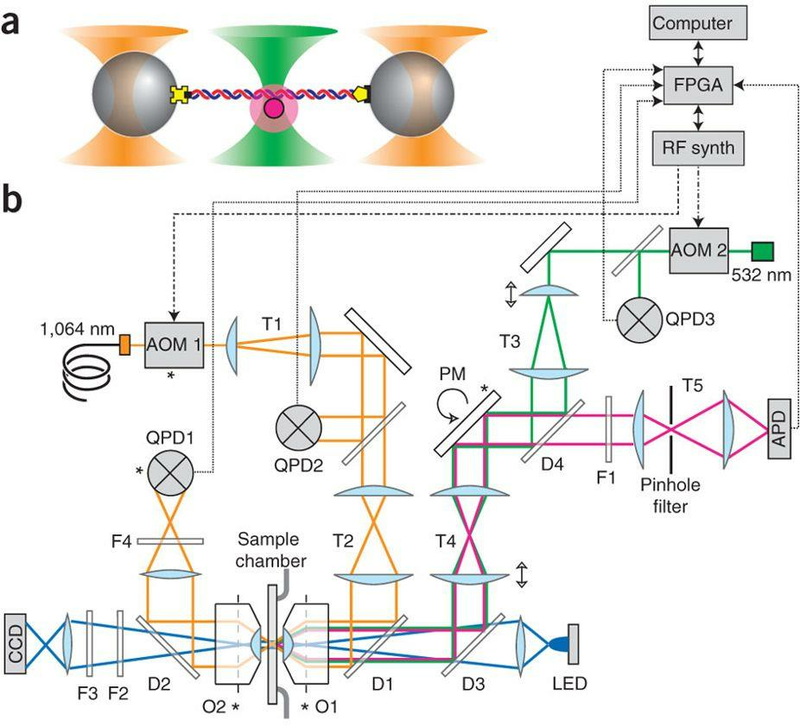 Using a technique pioneered in the CPLC combining single-molecule fluorescence and high-resolution optical tweezers (Comstock et al. Nat. Meth. 2011),Whitley et al. measured the force-dependent changes in end-to-end extension of aDNA strand held under tension when complementary oligonucleotides bind and unbind. The data reveal that the elastic behavior of ultrashort NAs is surprisingly consistent with canonical long-polymer models at low forces, but deviates from such models at higher forces as a result of force-and sequence-dependent boundary effects at the edges of the duplex. The work provides new insights into the elastic behavior of NAs at the shortest length scales probed to-date, which are relevant to biology and nanotechnology. Refer to: Whitley et al. Phys Rev Lett. (2018).